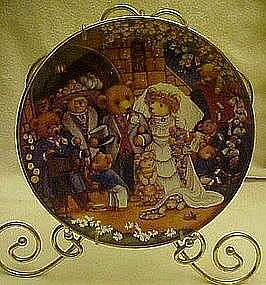 Cute Teddy Bear collector plate. Limited edition from artist Carol Lawson. Franklin Mint heirloom recomendation. Measures 8 1/4" and has real gold trim. Pristine condition, and has a wall hanger that I will throw in. This has no box or certificate. But is still adorable! !